Most Clevelanders who have been in the area a short time have heard of Public Square, Shaker Square, and Playhouse Square. But "Stadium Square?" This was a term tossed about quite extensively in the Heights area in the 1927-28 period. 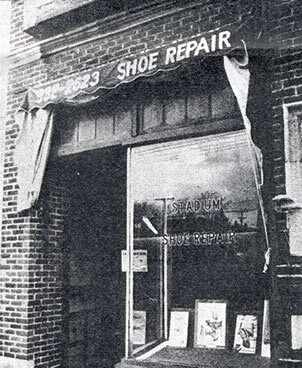 It could come alive once again if city merchants and/or residents or city planners would let it, for it refers to a small "section" of Cleveland Heights with no other distinctive name. The "Stadium Square" phrase referred specifically to the vicinity of the complex of two commercial /apartment blocks and two adjoining apartment houses at South Taylor Road and Superior Park Drive, named accordingly because of a planned stadium for a hillside site at South Taylor and Superior Roads. The stadium went the way of a great university planned for the Tremont neighborhood in the 19th century, a Cleveland College for University Circle, and a jetport for Lake Erie -- they never happened. 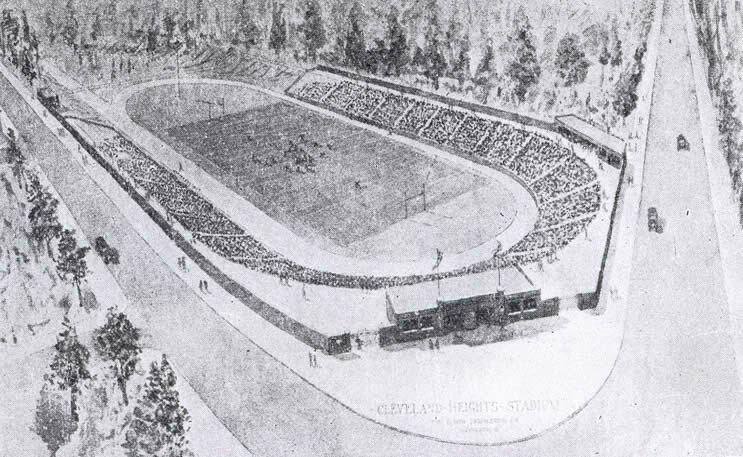 Planned to be built on little-developed parkland - 110 acres of city-owned ravine, including Cumberland Park and what was later to be named Cain Park - the stadium was to be amid a 1920s neighborhood, with older homes on Taylor, Superior and the streets between Blanche Avenue and Euclid Heights Boulevard. Comfortable, picturesque homes were built on Blanche and Superior Park from 1923, on land previously owned by the Minor and several other families. The city had bought land for a park in 1916 for $100,000. But in the mid '20s - an era of an expanding sports-enthusiastic population, and also a period when Cleveland's main sport events were held at League Park in Hough - a segment of the Heights population desired their own stadium. This was to be a sizable structure for municipal events -- such as high school athletics, musical events, pageants or civic gatherings such as for 4th of July fireworks -- on a natural amphitheatre site. The structure was first proposed by the Heights Kiwanis Club in 1927 and endorsed by the newly organized Exchange Club as well as the Heights Press in 1928, after a bond to finance the stadium won the majority of votes the previous November but failed to receive the necessary 55 percent of the total vote (losing by 67 votes). As the media stated that "engineers who have inspected it (the site) say that it is one of the finest natural locations for a stadium they have ever seen" and that the stadium would be " capable of seating upwards of 12,000 people" [the figure is stated elsewhere as 14,000] and would thereby "afford the largest out-of-doors gathering space on the Heights or in the entire eastern section of Greater Cleveland,' a second bond issue for $125,000 was placed on the ballot in November, 1928. In fact, a local newspaper article stated in September of that year that "while the financial condition of the city [Cleveland Heights] is now so good that these bonds could be issued without going to the voters with the question, the members of council feel that the people should be given an opportunity to express their opinion in the matter." It was anticipated that revenue from the completed stadium would cover all maintenance costs and "probably...wipe out in time the cost of construction." Artist's rendering of the Stadium, November 1927. The stadium could have been adjacent to the new high school, but construction would have been far more costly. An Oct. 12th editorial stated: "While residents of the older section of the Heights may think this location as somewhere far out, it will soon be the center of the population, as the fastest growing section of the Heights now lies beyond it.' Cleveland Heights had grown in ten years from a population of 15,000 to approximately 45,000, and in 1928 (according to some sources) had the lowest tax rate of any city in the country. The November ballot also included a $1 million bond issue for the expansion of school buildings. The City of Cleveland was urging a bond issue of $2.5 million for a stadium on the lakefront -- a stadium to seat 75,000 to 85,000. Yet despite much glowing commentary in the news media that reflected great confidence in the stadium issue, it again lost out in November 1928, not even claiming a majority of the voters. The school bond issues won easily and, soon after, its chief purposes were carried out -- the construction of Monticello Junior High and the addition of ten rooms to the still very new Oxford School. A Shaker Heights school bond issue, primarily to finance construction of a new high school, was even more successful. But meanwhile a whole Tudor complex was envisioned and constructed at South Taylor and Superior Park Drive. Built by the Roseman family, major property owners in the vicinity for many years beyond, the complex closely resembled the style of commercial/apartment complexes on East 140th Street in Cleveland, in Shaker Heights, Lakewood, and in Rocky River -- all from the late '20s. The Stadium Square real estate complex was planned in five sections. The fifth did not materialize as originally planned, but the two business/apartment blocks and apartment buildings facing each other on Superior Park were complete by September 1928, and all blended in with the late "20s English-style homes in the area. The only other large building on South Taylor was the public school, until the modified Tudor-style Cedar-Taylor Building was constructed in 1929. During the Depression, the Cain Park amphitheatre was constructed, with much federal funding, and the high school acquired its facilities for sports spectators. But nothing materialized in Cleveland Heights anywhere approaching the 1928 stadium ambitions in scale. Nor did other commercial or apartment structures appear on Taylor Road with any appreciable flair. Indeed, the clock tower of the 1980s Taylor Road Commons Plaza is the only newer distinctive commercial structure in the district and it is extremely modest in relation to some of the detailing of the '20s complexes it faces. --the only literal evidence of the area's unique history--survived until the late 1980s. "Taylor Commons" rather than apply a name relating to a unique bit of history. At that time, the only vestige of the area's potential heritage was a small store known as "Stadium Shoe Repair" and, since the mid-1990s, that too has disappeared.